Patients with thoracic aortic aneurysms that lead to acute aortic dissections are 12 times more likely to have duplications in the DNA in a region of chromosome 16 (16p13.1) than those without the disease, according to a study led by genetic researchers at The University of Texas Health Science Center at Houston (UTHealth). The results of the innovative study, which included researchers at Baylor College of Medicine, are published in the June 16 issue of the open-access journal PLoS Genetics. In human DNA, there are regions of the DNA that are deleted or duplicated and these are referred to as copy number variants or CNVs. These CNVs can cause a loss of the number of copies of a gene from two to one (deletion) or cause more copies of a gene from two to three (duplications). Researchers are just beginning to identify a subset of these CNVs that can increase a person's risk to get a particular disorder. "We're just starting to understand copy number variants and their link to disease," said Dianna Milewicz, M.D., Ph.D., senior author, professor and the President George H.W. 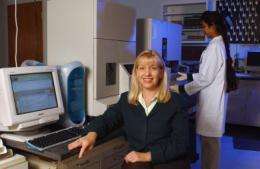 Bush Chair in Cardiovascular Research, and director of the Division of Medical Genetics at The University of Texas Medical School at Houston, part of UTHealth. "This is the first recurrent CNV discovered to be associated with thoracic aortic aneurysms and dissections. In addition, it is the first recurrent copy number variant to cause a predisposition to more than one disorder, neuropsychiatic conditions and thoracic aortic disease." This region of chromosome 16 (16p13.1) contains nine genes and the additional copy of any of these nine genes can potentially cause predisposition to different problems. Duplications of 16p13.1, which are present in approximately one in 1,000 people, have been associated with a variety of neuropsychiatric disorders, such as schizophrenia and attention-deficit hyperactivity disorder (ADHD). Those nine genes include MYH11, whose dysfunction is known to affect the smooth muscle cell tissue in major arteries in the body, including the thoracic aorta. A weakness in the lining of the thoracic aorta, which carries blood from the heart to the rest of the body, can lead to an aneurysm and/or dissection, which can cause sudden death. An estimated 8,000 people die annually from thoracic aortic aneurysms and dissections (TAAD). Previous studies have determined that other types of MYH11 genetic alterations can cause thoracic aortic disease to be inherited in families. Researchers found 16p13.1 duplications in eight of 765 patients with non-familial, non-syndrome-related thoracic aortic aneurysms and dissections compared to four patients in 4,569 controls. The 12-fold increased risk for aortic disease associated with this duplication of this region of chromosome 16 is greater than the three-fold increase for schizophrenia and the five-fold increase for ADHD. "The results of this study could affect clinical care because it appears patients with 16p13.1 duplications have an aggressive form of the thoracic aortic disease that causes aneurysms to dissect at smaller diameters," Milewicz said. "Also, once doctors are able to use the entire genome, people with duplications in 16p13.1 would need to have their aortas monitored." Some of the patient samples used for this study were obtained from GenTAC, a National Institutes of Health (NIH)-funded registry of patients with thoracic aortic disease.